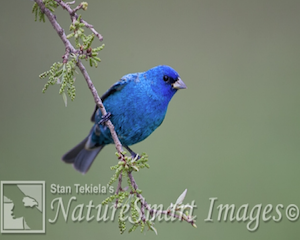 In this week’s column, Stan Tekiela shares with us the hard work of an Indigo Bunting mother during nesting season. Every now and then, I am fortunate enough that people will give me a call to say they found something cool in their yard and wonder if I want to photograph it. Recently, that very thing happened. It started with a text message from a homeowner who came across a nest when he was clearing the edge of his wooded yard. It was a small nest, low to the ground, and he felt bad about inadvertently exposing the nest by clearing the brush. He took a picture and texted it to me, saying he thought it was a hummingbird nest. When I received the text titled “hummingbird nest“ I got excited, but the moment I looked at the pic I knew immediately it wasn’t a hummer. Four beautiful white eggs were in the nest. Hummingbirds only have two eggs at the max, so it couldn’t be a hummingbird. The next day, I stopped by and walked across the yard with the homeowner towards the nest. We weren’t 40 feet away when I saw the small nest and a tiny bird that jumped from the nest and dropped right to the ground and disappeared. “Now that is interesting,” I thought to myself. I didn’t get a good enough look to see what it was. About 10 minutes later, I had my blind set up at a very respectful distance, and I sat and waited for the mystery bird to return. It took only a few minutes before the mother returned, and I could clearly see it was an Indigo Bunting. This would be only the second nest I have ever seen of this species in the 30 years I have been a professional wildlife photographer. 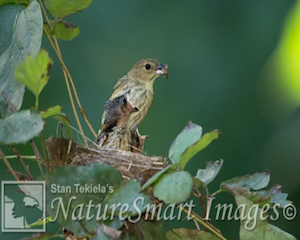 This was the beginning of an amazing adventure for this Indigo Bunting mother. Over the next two weeks, this mother would face many obstacles while trying to raise a family. I came back many times to capture the amazing saga of this bunting. The first of many obstacles the mother faced was living with predators. The first morning I was there, a pair of Cooper’s Hawks were visiting the feeding station just 50 feet behind me. These woodland hawks make a living by eating other small birds. I would watch as the mother Indigo would slip out of the nest to take a break and stealthfully move about the forest floor, gathering something to eat for herself before slipping into the nest to incubate. The ever-present danger was just yards away. A couple days later, the homeowner contacted me again to say that something had happened and he wanted me to stop by and take a look. Two of the Indigo Bunting eggs were missing, and a new, larger, spotted egg was in their place. Yes, a Brown-headed Cowbird found the newly exposed nest and took out 2 eggs and replaced it with one of her own. 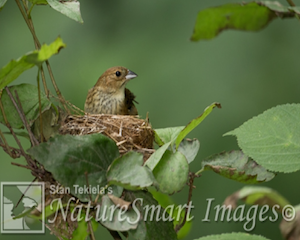 Cowbirds are nest parasitic birds that lay their eggs in other birds’ nests. Knowing that the Indigo Bunting had already been incubating for nearly 10 days, I felt this shouldn’t be too much of a threat. The very next day, the two Indigo Bunting babies hatched, which spelled doom for the cowbird egg because the mother wouldn’t be incubating while feeding her newly hatched babies. She had dodged another bullet because the cowbird baby most likely would have pushed out the Indigo Bunting babies. The next time I was there photographing, an entire family of Broad-winged Hawks were flying around the yard. Freshly out of the nest, the young hawks were all over the yard, begging for food from their parents. This was another predator challenge for the Indigo mother. The babies grew quickly, with mom feeding them juicy caterpillars and a wide variety of other insects. I could hear the male Indigo Bunting singing from the treetops nearby, but he never came in to help the mother feed the young. She was doing this all on her own. On my last visit, I set up my blind and settled in to wait. The mother Indigo came in to feed the babies a couple large caterpillars. The babies were so big they nearly jumped right out of the nest to grab their meal. Then, just like magic, one of the babies got on the rim of the nest and fluttered its wings. While the second baby watched, the first one climbed up the short sticks holding the nest, flapped its wings, and flew off into the forest. Inspired by its sibling, the second baby did the same thing; off they both went into the world, healthy and with an amazing mother to look over them.